Hydrophobic literally means “the fear of water”. Hydrophobic molecules and surfaces repel water. Hydrophobic liquids, such as oil, will separate from water. Hydrophobic molecules are usually nonpolar, meaning the atoms that make the molecule do not produce a static electric field. In polar molecules these opposite regions of electrical energy attract to water molecules. Without opposite electrical charges on the molecules, water cannot form hydrogen bonds with the molecules. The water molecules then form more hydrogen bonds with themselves and the nonpolar molecules clump together. The hydrophobic effect is caused by nonpolar molecules clumping together. Large macromolecules can have hydrophobic sections, which will fold the molecule so they can be close to each other, away from water. Many amino acids in proteins are hydrophobic, helping the proteins obtain their complicated shapes. The hydrophobic effect extends to organisms, as many hydrophobic molecules on the surface of an organisms help them regulate the amount of water and nutrients in their systems. Cell membranes are made of macromolecules known as phospholipids. Phospholipids have phosphorous atoms in the heads of the molecules, which attract water. The tail of the molecule is made of lipids, which are hydrophobic molecules. The hydrophilic heads point towards water, and the hydrophobic tails attract toward each other. In small groups, phospholipids form micelles. As seen in the picture below, a micelle is a small hydrophobic ball. The hydrophobic tails expel water from the center of the ball. 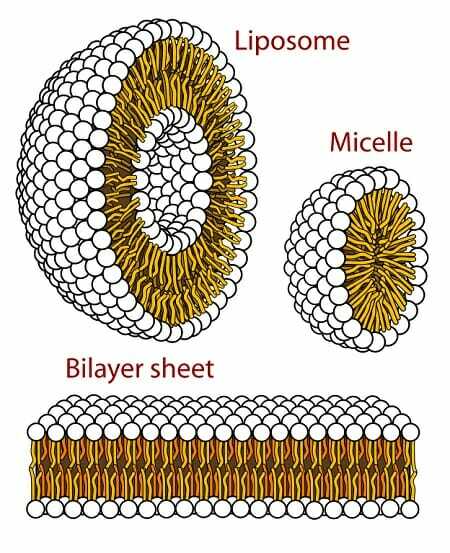 Cell membranes are composed of two phospholipid layers, known as the phospholipid bilayer. The middle of the sheet is made of hydrophobic tails, which expel water and can separate the contents of the cell from the outside environment. Cells have a variety of special proteins embedded into the membrane which help transport hydrophilic molecules like water and ions across the hydrophobic middle portion of the membrane. In eukaryotic cells, organelles are formed inside of cells from smaller sacs created from phospholipid bilayers. Scientists have used the hydrophobic properties of phospholipids to create another structure to deliver medicine and nutrients to cells. As seen in the graphic above, liposomes are small sacs that can be filled with medicine. With the right proteins embedded into the membrane, the liposome will merge will the membrane of a target cell, and deliver the medicine to the inside of the cell. Many plants have hydrophobic coatings on their leaves. It is important that rain and water are not absorbed through the leaves, as this would disrupt the flow of nutrients, which rely on the passage of water from root to leaf. If the water were allowed to travel by osmosis through the cell membrane and into the leaf, it would change the osmotic pressure in the leaves, and water could not travel up from the roots. Even aquatic plants protect their leaves with hydrophobic substances, which insures nutrients are pulled from the roots and water flows in one direction through the plant. 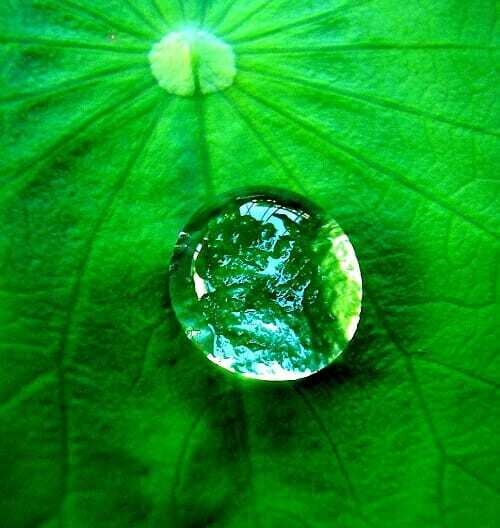 Below is an example of a very hydrophobic leaf, which causes water droplets to roll off the leaf. Many aquatic birds must protect their feather from water intrusion, and secrete hydrophobic oils onto their feathers, which keeps water from penetrating. If you’ve ever heard the term “like water off of a duck”, that phase refers to the hydrophobicity of duck feathers. Ducks, and many other aquatic birds, spend a considerable amount of time underwater collecting food. However, they must also fly when they exit the water. If water was allowed to penetrate their feathers, the birds would become too heavy to fly. The birds brush the hydrophobic oils they secrete from their skin and special glands onto their feathers. When they dive underwater, the oils form a hydrophobic barrier that keeps water from penetrating. Then, when they emerge, they simply shake the water off and are able to fly. Hydrophilic – Molecules or substances that are attracted to water. Polar – Molecules having static electric charges, which can interact with water. Nonpolar – Molecules that do not have static electric charges, and are much more likely to interact with other nonpolar molecular than with water. Lipophilic – Substances that are attracted to fat, different than hydrophobic. 1. Some amino acids are hydrophobic, and some are hydrophilic. Hydrophobic amino acids tend to cluster together in large proteins. Why is the order of amino acids in a protein important? A is correct. Due to hydrophobic effects such as the interaction of hydrophobic amino acids, and many other bonds, proteins take on a complex structure. These shape of a protein is incredibly important. Proteins used in cell recognition take a certain shape, which other cells can “recognize” by proteins that correspond to their shape, like a lock and key. If the amino acids in a protein are out of order, the protein will not fold into the right shape, and will malfunction. 2. A substance is created that has very strong electrical dipoles on the molecules, but does not interact with water, due to the strong interaction it has with itself. How would you describe the molecule? C is correct. Although this would be uncommon, this substance would be hydrophobic and polar. Polarity is a condition caused by static electrical charges on molecules, which attract each other. Usually, these charges attract water, but this is only because they allow water to form hydrogen bonds with a substance. If a substance was created that stopped hydrogen bonding, it would be hydrophobic. Thus, a molecule could be both hydrophobic and polar. 3. Many reptiles, even desert-dwelling reptiles, have hydrophobic scales on the outside of their body. Why would a desert reptile want a hydrophobic covering? B is correct. The scales of many reptiles protect the animals from water loss due to evaporations. While many amphibians that do not have scales cannot get very far from a source of water, many reptiles live in environments almost devoid of water. Desert dwelling animals would quickly dry up were it not for their hydrophobic skin and scales protecting them from evaporation.